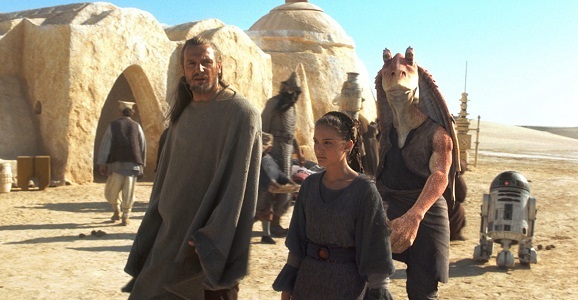 Most Star Wars fans begrudgingly remember Phantom Menace for Jar Jar Binks and the podracing scenes — if not more so for the rabid anticipation before its release. Ebert, however, thought it “an astonishing achievement in imaginative filmmaking” and said he watched the film in the “same spirit” that he enjoyed films like 2001 and Metropolis, with the noticeable difference being between those films’ dark outlooks and Phantom Menace‘s cheerful energy. (The only thing he says about Jar Jar is that his “physical movements seem based on afterthoughts.”) This is a movie in which Ebert completely allows for dim characters and plot-driven dialogue, so long as they’re surrounded by cinematic wizardry. But that just won’t fly with us.